The Kona Crime Prevention Committee recognized Officer Jeremy “Scotty” Lewis as “Officer of the Year” in a luncheon ceremony on Wednesday (September 14) at King Kamehameha’s Kona Beach Hotel. In April, he was was recognized for his investigation of an unauthorized entry into a motor vehicle case. The case ended with the arrest and successful prosecution of suspects involved in multiple car break-ins targeting tourists. Since then, the Kailua Village area has experienced a downturn in such crimes. In June, Lewis received an award for his investigation of financial crimes stemming from a burglary and the theft of laptop computers and two credit cards. Through his efforts, Lewis identified two female suspects and initiated 49 additional offenses against them. They were charged with multiple felony financial crimes. 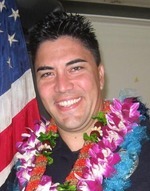 Chief Harry Kubojiri said Officer Lewis epitomizes the Hawaiʻi Police Department’s core values of professionalism, integrity, compassion, team work and community satisfaction. “Because of his dedication and sharp investigative skills, two separate crime sprees no longer plague our community,” Kubojiri said.